Knowing that SNAE’s nest should be nearby, we settled ourselves into the bushes to watch and wait. Junco nests are very hard to see: even when I know where one is, even when I’ve seen it before, I have trouble finding it again. Finding a new nest somewhere in twenty square meters of forest is out of the question. So our strategy is to hide near where we think the nest is and wait for the parents to resume feeding the chicks, see where the parents go, and find the nest that way. Unfortunately for us, SNAE and his mate were high-strung parents. We hid; they chipped, and chipped, and chipped. In the past, juncos have calmed down and resumed feeding their chicks within ten minutes of our hiding. SNAE and his mate took more than an hour. I was close to calling off the vigil, concerned about the birds’ stress levels, when SNAE’s mate flew down into some bushes with a bug in her bill and then flew out without it. We found just one chick, AIRY, in more of a hidey-hole than a nest. 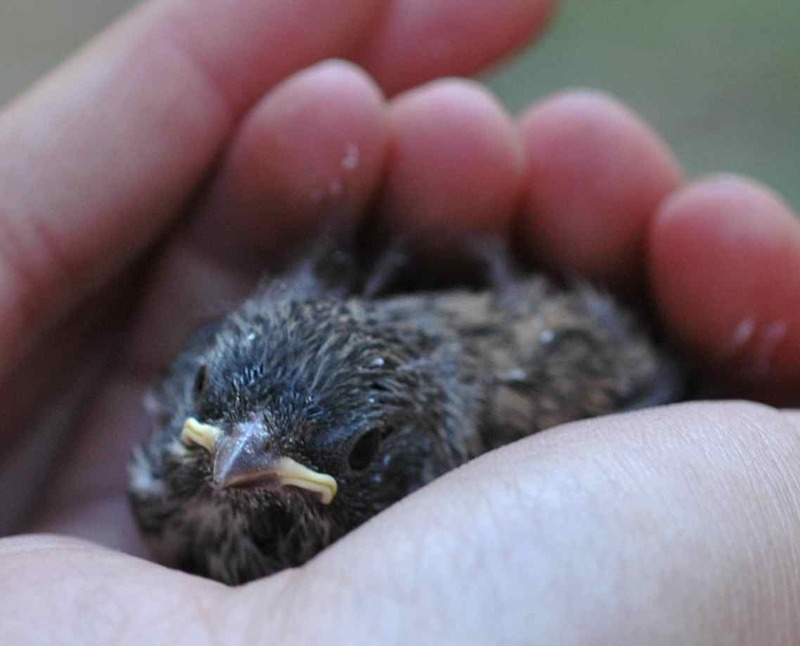 It’s late in the season, and birds often have fewer chicks later in the season. It’s also possible that this pair had more chicks but lost them to predators, which might explain why AIRY wasn’t in a proper nest, and why his parents were so concerned about our presence. AIRY and his parents called back and forth with each other while we banded and measured him. We put him back in his hole and left as quickly as possible, so that the family could reunite and calm down. AIRY should fledge within a week. He’ll have to eat a lot and learn fast to catch up with the rest of this season’s fledglings. 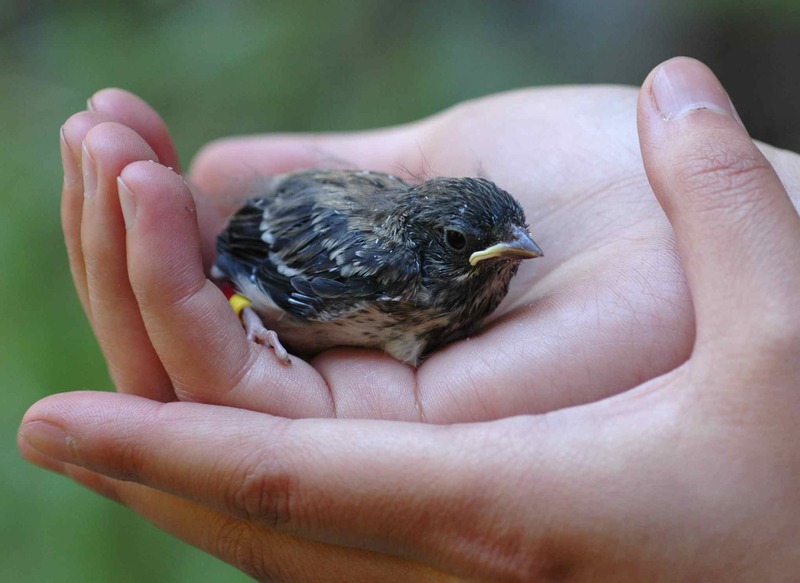 This entry was posted in DEJU, field work, notable juncos and tagged AIRY, birds, Dark-eyed Junco, field work, nestlings, science, SNAE by toughlittlebirds. Bookmark the permalink. 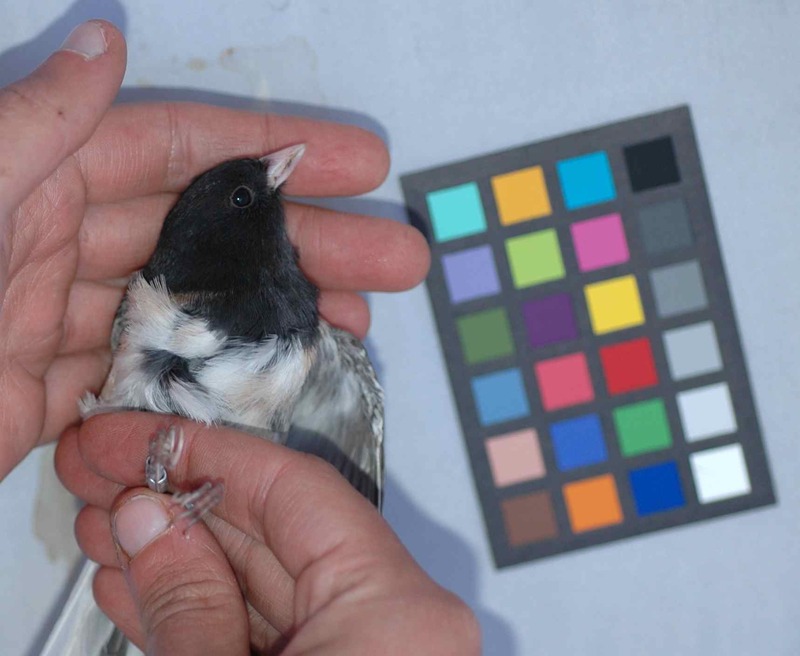 I’m doing colour quantification in my master thesis, and I was wondering about your method for comparing colour among your birds. Have you written something about this in an article that I can search for? If not, are you using anything else than the colour standard for comparing the photos? Unfortunately I’m going to be of limited help to you because I haven’t gotten around to actually doing any color analysis yet. I was planning to use ColourWorker (http://www.chrometrics.com/background.html), which requires only the color standard to be in the photo for comparison. For thinking about color I’ve especially relied on Pike 2010 (in Behav Ecol & Sociobiol); Stevens et al. 2007 (Biol J Linnean Society); and pretty much everything Endler ever wrote. If you have a spectrophotometer and can get good quality spec images, you’ll be way ahead of me, of course; I’ve focused on ways to use data from field conditions with a portable digital camera.